Planning out the experiment before you conduct it: “Look before you leap” is a mantra of every good experimenter. Careful planning always increases the value of your experiment results while minimizing the amount of work and money you have to invest. Exploring the effect of more than one input variable at a time: This strategy allows you to be efficient while capturing unsuspected and sometimes hard-to-find interaction effects. Minimizing the number of required runs in your experiment: You may be surprised how much you can get out of a small number of properly planned experimental runs. Replicating key experiment conditions to assess variation: A part of every experiment is understanding how much of your system’s or process’s behavior is deterministic (the result of a specific cause) and how much is random variation. Accounting for known and unknown factors that you aren’t directly including in your experiment: You can never take everything into consideration in your experiment. However, Six Sigma offers ways to keep these nuisance factors from clouding the results of your experiment. Screening experiments: The whole point of this stage is to quickly verify which factors have a significant effect on the output. When you start investigating a process or system, your experiments are designed to handle a large number of factors or variables because you identify all the possible Xs that may be influencing the output Y. But not all of those inputs affect the output, so screen them out. Characterizing experiments: When you’ve screened out the unimportant variables, your experiments focus on characterizing and quantifying the effect of the remaining critical few inputs. These characterization experiments reveal what form and what magnitude the critical factors take in the Y = f(X) + ε equation for your process or system. 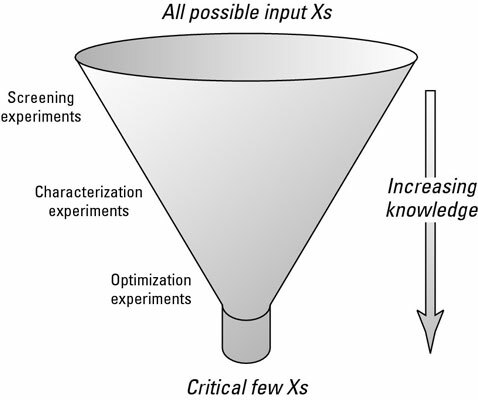 Optimization experiments: After characterizing your process or system, the final step is to conduct optimization experiments to find the best settings of the Xs to meet your Y goal. Your goal may be to maximize or minimize the value of the output or to hit a certain target level. More often, your goal is simply to minimize the amount of variation in the output Y. Because each of these experiment types has a very different purpose, the forms and plans of the experiments you conduct at each stage are also different. Here is the progressive and iterative approach used in Six Sigma experiments.